This is a comma delimited txt file containing individual *Uma inornata* genotypic data for 11 microsatellite markers. Fields include sample number, collection year& population name, followed by allele calls in 2 column format. 0 = missing data. 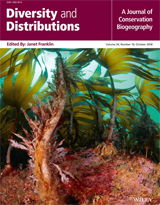 Individual collection localities are available from the authors upon request. Aim: The frequency and severity of habitat alterations and disturbance are predicted to increase in upcoming decades, and understanding how disturbance affects population integrity is paramount for adaptive management. Although rarely is population genetic sampling conducted at multiple time points, pre- and post-disturbance comparisons may provide one of the clearest methods to measure these impacts. We examined how genetic properties of the federally threatened Coachella Valley fringe-toed lizard (Uma inornata) responded to severe drought and habitat fragmentation across its range. Location: Coachella Valley, California, USA. Methods: We used 11 microsatellites to examine population genetic structure and diversity in 1996 and 2008, before and after a historic drought. We used Bayesian assignment methods and F-statistics to estimate genetic structure. We compared allelic richness across years to measure loss of genetic diversity and employed approximate Bayesian computing methods and heterozygote excess tests to explore the recent demographic history of populations. Finally, we compared effective population size across years and to abundance estimates to determine whether diversity remained low despite post-drought recovery. Results: Genetic structure increased between sampling periods, likely as a result of population declines during the historic drought of the late 1990s–early 2000s, and habitat loss and fragmentation that precluded post-drought genetic rescue. Simulations supported recent demographic declines in 3 of 4 main preserves, and in one preserve, we detected significant loss of allelic richness. Effective population sizes were generally low across the range, with estimates ≤100 in most sites. Main conclusions: Fragmentation and drought appear to have acted synergistically to induce genetic change over a short time frame. Progressive deterioration of connectivity, low Ne and measurable loss of genetic diversity suggest that conservation efforts have not maintained the genetic integrity of this species. Genetic sampling over time can help evaluate population trends to guide management.